This file allows educators to quickly plot an individual student's benchmark data over normative distributions for fall, winter and spring. Norms are entered manually. Up to 100 students can be entered, and scrolled through to quickly plot student performance. 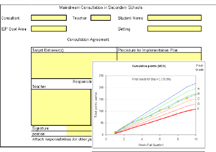 This template allows a teacher to track a group of up to 50 students on one to four measures or behaviors. It is recommended that if a teacher is tracking more than one group, that one template is used for each group. This template is intended to be used to monitor and evaluate small group behavioral interventions. for each student receiving a small group intervention, enter the percentage of possible points earned per day into the data entry sheet, and both group and individual graphs are automatically produced. In addition, by selecting the option to show trends and evaluate progress, the template automatically compares the criteria you set up to the observed performance of students.